Has learning English been difficult for you? Have you been doing it the traditional way and are still struggling? Well, our goal today is to introduce you to a gentleman who will share his experience and advice on how to learn REAL English. 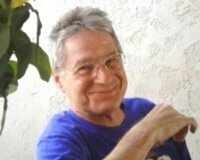 Mr. Michael Marzio is the creator of RealEnglish.com and the founder of the Marzio School, a language school in France. Michael has been teaching English for many years and realized one of the key components to learning a language is to listen to it constantly. He introduced this concept in his teaching and saw amazing results. Let's learn more about this from Michael. 1. Real-English.com is a very unique and useful website for English learners. Can you give our readers some basic information on what they can find there? - a Facebook page for interaction with and between the users. I film, edit, and categorize the videos in the same way as the major ESL/EFL publishers, so that the videos and lessons are easy for teachers to use as a complement to whatever "main method" they normally use. For example, every beginner method includes a section on how to introduce yourself, and how to introduce other people, so there is a corresponding Real English video for this function. A Real English lesson is always based on a video. The exercises for the videos are made with free software called "Hot Potatoes". I chose this program simply because it allows for an extremely wide range of different types of activities. You can make any type of exercise imaginable, and you can add pictures, audio files, video, of course, and with a bit of customization, you can also add a Java applet which enables students to record themselves and then compare their own pronunciation to the model. One example of the possibilities provided by Hot Potatoes: you can easily design an exercise where the students have to type an answer, but if they are wrong x times, then the same exercise transforms itself into an easier multiple choice exercise! In this way, the student is challenged but never lost. All he has to do is keep on trying until he gets feedback about his/her answer. The Facebook page is used by students and teachers: questions about the videos or lessons are often asked, as well as questions about English in general. I encourage teachers to answer these questions (instead of myself), so as to build up a community of learners helping each other. It's a rather lively place. I also post various types of activities, to maintain interest. 2. What prompted you to start the Real English project? I have to provide a bit of background in order to answer this question. I'm from NJ, USA. I created a language school in the south of France way back in 1976. The students were, and still are, French professional people, engineers, businessmen, secretaries, technicians, etc. Beginning in 1992, I noticed that when a student came back from a business meeting in London or New York, for example, they would often say "the people I met speak a lot faster than you" (meaning all the teachers). Or they would point out that it was relatively easy to communicate when the discussions concerned the work they had in common with their Anglo-Saxon counterparts, but became very difficult when they had general conversation around the dinner table. So, a very simple idea flashed through my mind. Why not film ordinary people speaking normally about everyday topics, and use these conversations in the classroom? Although the idea was simple, it was much more difficult to realize than I had imagined. 3. How did the shooting of the videos go? Were there any unexpected challenges you encountered? And what kind of responses did you get from the interviewees? One difficulty was deciding what is acceptable speech in the learning environment. In the end, for 12 people interviewed, only one of the 12 would finally end up in a Real English video. In my experience, many people mumble when they speak spontaneously. Others make grammar mistakes. Some speak too fast. (One comment I often receive is that the interviewees speak too fast, but in reality, those who really spoke too fast were eliminated). And to be perfectly honest, some people just seemed too boring. It has taken a lot of trial and error. The challenge has always been to approach strangers in the street, explain why we are filming, and get them to agree to sign a release form after the interview. Finally, I could only hope that they would be inspired by our questions, and answer in ways useful to our educational aims. After a year or so, we learned to set up our filming equipment on very busy sidewalks only. We also learned to be patient, and to try to approach happy people walking our way. That is to say, people (preferably couples or small groups) who were smiling or laughing as they walked by. At the same time, they had to have time on their hands at the moment of our approach. Deciding on what questions to ask was also a challenge. In the end, about half of our questions worked. In other words, since we wanted to cover the most important points of grammar and functions so as to reflect the content from the Big EFL Publishers, we had to think of questions which would elicit specific verb usages, for example. 4. You began creating videos of real conversations for your students because, as you say, no one in the real world speaks "classroom English". What sort of impact did these videos have with your students? Most of my students seem somewhat shocked the first time a teacher uses Real English (we use the DVD version on TVs in the classrooms, or project to screens from laptops, and assign the on-line lessons as homework). Once again, they feel like everyone is speaking too fast. But this first reaction does not last long in most cases, since the teacher facilitates understanding using various techniques to aid listening comprehension. I should add a quick note here. My school is located in France, one of the countries where the public education system does not prepare students very well for speaking or understanding spoken English. Scandinavians, for example, have much more intelligent approaches to language learning than Mediterranean countries. 5. What are the top 3 pieces of advice you can give to English learners who want to speak REAL English? I encourage students to listen many times to a text before reading the corresponding text, even if they don't understand a single word. In a second phase, after reading and understanding, the emphasis remains on listening. Students will speak more correctly, and with better pronunciation/accents if they follow this rule. 6. Real-English.com is a product of The Marzio School in Istres, France. Please tell us about the school and your role there. As I already mentioned, I created my language school in 1976. I found corporate customers through dogged door-to-door prospection, then hired teachers, took care of course organization, etc. My wife Valérie, the only French member of the team, took care of, and still takes care of everything else (accounting, general management, legal aspects, etc.). I've very recently retired, but still keep in touch with the team, and I repair TVs and computers, etc. and offer my support in various part-time roles. When I began the Real English project, I turned over most of my school responsibilities to Helen King, who is now in charge of all the tasks I used to do (except for repairing the TVs). I apparently did something right: there is very little turnover. Most of our teachers have been with us for decades and obviously enjoy their work. 7. Were you always interested in teaching English? What inspired you to do all this? No. I studied philosophy at university in the States and wanted to become a writer. I went to Paris on vacation, and a friend offered me an EFL teaching job. So I slowly learned how to teach English. Then I created a language school for a large company in Lyon. After realizing that I was capable of doing such a thing, I went further south to the Marseilles area, so as not to be in competition with my employer in Lyon, and began setting up my own school. 8. Who are some of the other faces behind Real-English.com? The most important faces behind Real English are the interviewers. They are all personal friends of mine. Most of them are close friends from the 1960s! Sometimes you can see them in the videos, and you can always hear them asking questions. Although I made this clip in 2008, very little has changed since then, aside from new videos and one new interviewer, Joanne, who does not appear in this 2008 "about" video. You'll notice my friends Charlie McBride and Roger Godfrey at the beginning of this clip. 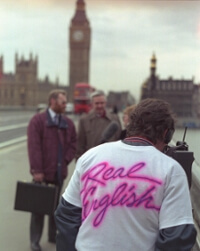 The first Real English videos appeared on VHS cassettes, and there were a lot of jingles between the interviews, created by Roger with Charlie's help. Ken Ryan, a very good friend since we first met in grammar school when we were 8 years old, has provided me with access to his servers which host Real English. He has also been very supportive of my efforts in general. 9. You travel between France and the USA, a dream life for many. How is it like in actuality? It IS a sort of a dream life. It's a shame we don't realize how lucky we are as soon as we get into a habit of doing something pleasurable and out of the ordinary. People often ask me if I prefer the USA or France, and the truth is that I do not prefer either. I prefer going back and forth between the two, instead of always being in one country or the other: the USA for filming, and France for editing! 10. Finally, if you were not helping English teachers and students with your school and site, what would you be doing? I'd be blogging about the insanity of world affairs, and the dangerously ridiculous American political circus of the moment. I'd be writing about Martin Heidegger's question "Why Is there something rather than nothing?" and the awe I feel about the universe and human existence, and the despair that comes with the realization that as man evolves in many ways, there is little hope that he will become a peaceful species. Well, there we've had it from Michael. Thank you Michael for truly enlightening us.